I have a 2000 986 s with cracked seats. Can Porsche seats from "recent" years fit with a bracket adjustment? The replacement covers are my first option... Used seats in "good" shape are available. Can they be made to fit? All 996 seats are a direct swap. 997 seats are also a direct swap but you want to make sure you get manual seats (manual front and rear with power recline). The only limit it width on ither aftermarket seats. 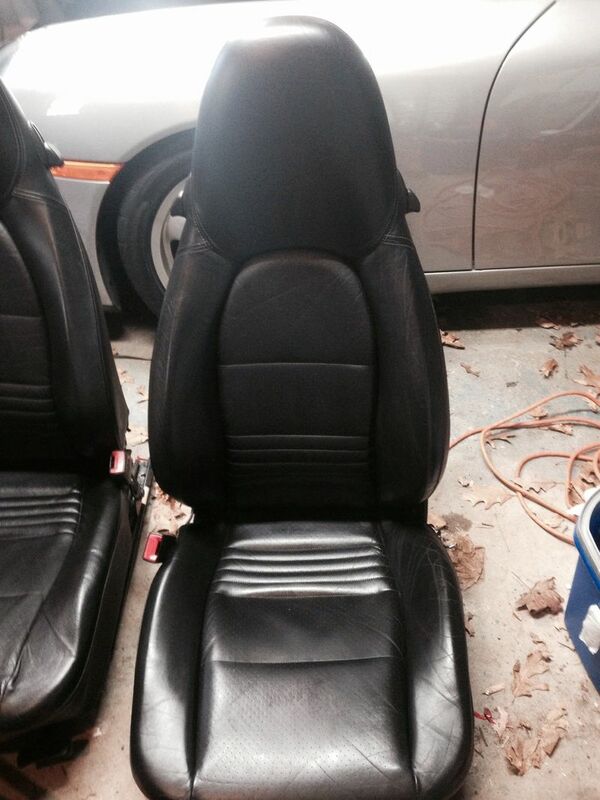 I have recaro sportster cs seats from an EVO IX in my boxster on planets seat brackets. Ebay has a ton tod cayman seats available for 5-800$ and offer a substantial upgrade over stock. I'm willing to spend a grand... Just not $3,000 to cover current manual seats. Just retired and will now have the time to Spring, Summer, Fall drive. 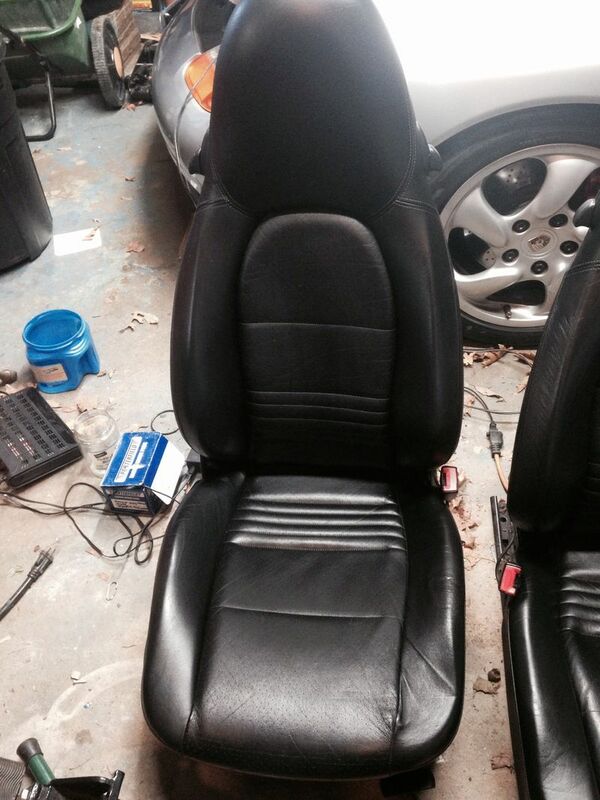 I replaced my deteriorated vinyl seats with ~90% full leather 986/996 seats via ebay purchase from qualityporscheparts. This was less expensive than purchasing even one recover kit from Porsche. Had to visit local upholstery shop to transfer over the seat heating elements, so there was that expense, but I'm still happy. You'll set an airbag warning light doing this should you cycle ignition on while a seat is electrically disconnected. How cracked? My seats are cracked and worn and I'm trying "Leatherique". Started last evening and hope to have them cleaned and ready for a little dye later today. So far, the cracks have improved, now just creases (not parsing words, just not sure how to describe). If it works, less than $100. IIRC installing 987/997 seats requires some fiddling with the seat electrical connector to make the connection. I just pulled black leather stock seats from my 2000 Box S. I replaced for Sport seats. Nothing wrong with them, just wanted sport seats. Wish my sports were as good of shape as my Sports. They have approx 55k on them. If you are interested in buying, I can take pictures. I was going to keep for future owner after I pass , but I just don't have the room. Heck, I'm in MA so easy for you to see if interested. No shipping. I got mine from an Ebay seller located in Albuquerque. About 600 bucks for vinyl, plane jane seats. Not exactly like new, but good enough and better than the old ones. I contacted "Leatherique" as mentioned in another forum. I have leather seats in my 2000 S. The Leatherique products worked for me. The drivers side had normal wear and some minor cracks. The passenger side was in mint condition. The rejuvenator and cleaner they supplied along with the dye and crack repair are very good products. Check out their web site. I found two Black '03 seats in CT. I wish I had the DBOX reply prior to my pick up. I will have Savanah seats for a 2000 s available in RI. I have yet to attempt the install of the '03 into the '00. Will I have any issues? I'm also thinking of taking out the back of the old seats and creating a two / tone seat look. Just thinking about it. No as long as the seats have similar features. If the new seats are an upgrade (e.g. you are upgrading from 2-way power to 8-way power) you will need to address some electrical wiring issues. New, '03 seats installed into the '00 without a hitch! I removed the center back Savannah color '00 seat that fit perfectly into the center of the '03 Black. When the sun comes out I will send pics. What should I harvest off of the '00 seats? Does anyone need ??? Old 2000 replaced with new '03. I used the center back from '00 that fit just fine. Last edited by Woz; 04-10-2019 at 03:44 AM. Reason: pic attach ?? ?